Above: The Distinction Between Here and There, Now and Then, The ‘Real’ & The ‘Virtual’ diptych and series of framed artefacts. Click to view slideshow or view images on Flickr. The Distinction Between Here and There, Now and Then is a work about performance that occurred through the internet in two stages and is presented/documented as a diptych with framed artefacts. The work involved the commissioning, production and framing of two paintings to be exhibited as a diptych. 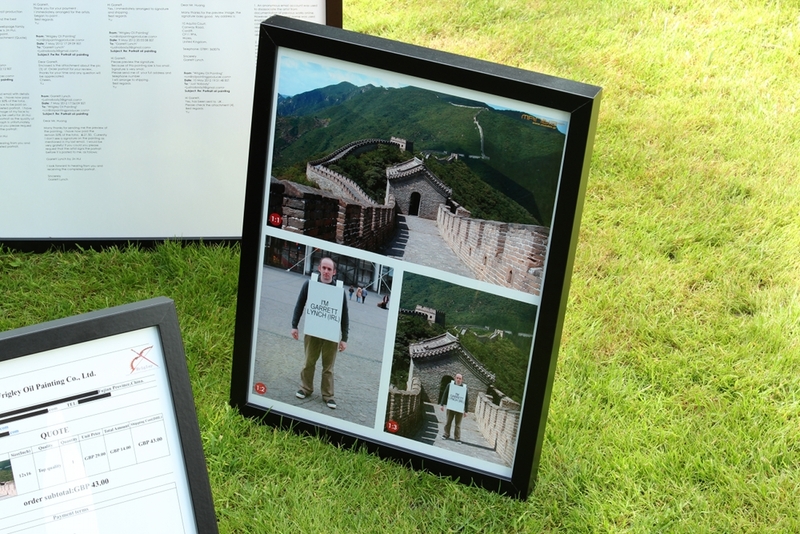 The first painting, The ‘Real’, is a reproduction of a performance photograph of the artist standing on the Great Wall of China wearing the Sandwich Board; a constructed replica of a 3D object from Second Life that has been employed in numerous ‘virtual’ performances. 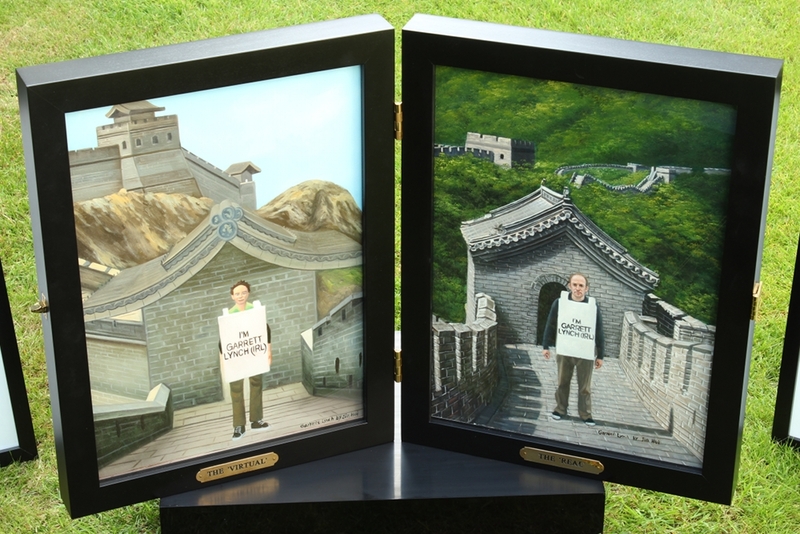 The second painting, The ‘Virtual’, is a reproduction of a performance screenshot of the artist’s Second Life representation wearing the original sandwich board standing on a 3D reproduction of the Great Wall of China in Second Life. Each stage of production was negotiated separately online through websites and emails. 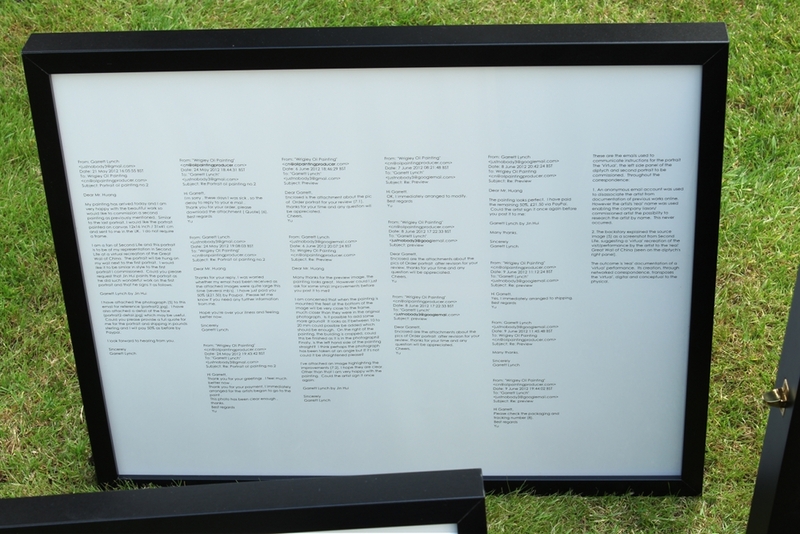 Participants working on the paintings and the media artefacts produced as part of their creation were unaware of nature of the work as performance based or its intended outcome as diptych and series of framed artefacts. Participants were simply informed that these were to be individual portraits from photographic sources for the artists home. The negotiation of the paintings creation, developing a relationship with those working on them and the media this process generated became a performance of collaboration through a network. …edges demarcate the spatial and temporal distinction at the base of all representation – the distinction between here and there, now and then. Pane was keenly aware that the performance of an action and its photographic image may be different in spatiotemporal terms, but that the former is ultimately defined by the latter. Below is a detailed description of the process and concept of each stage of the work. An anonymous email account was used to disassociate the artist from documentation of previous works online. 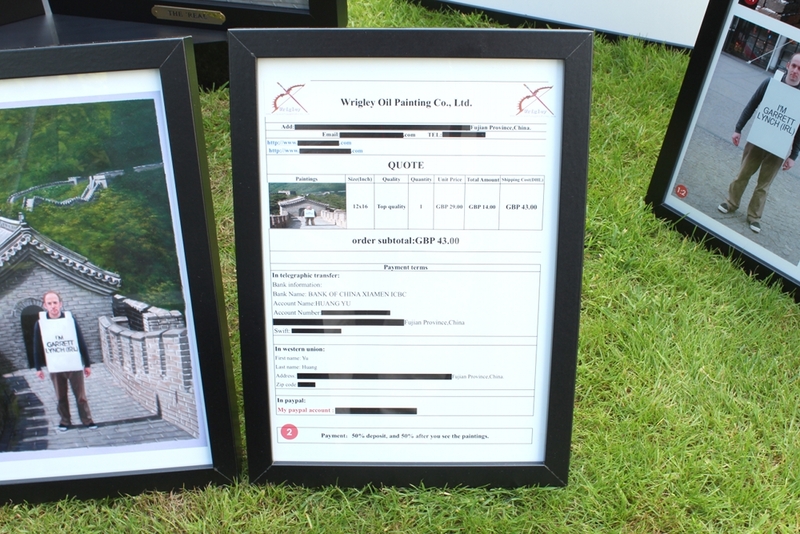 However, the artists ‘real’ name was used enabling the company liaison/commissioned artist the possibility to research the artist by name. This never occurred and no question was ever asking about the subject matter. 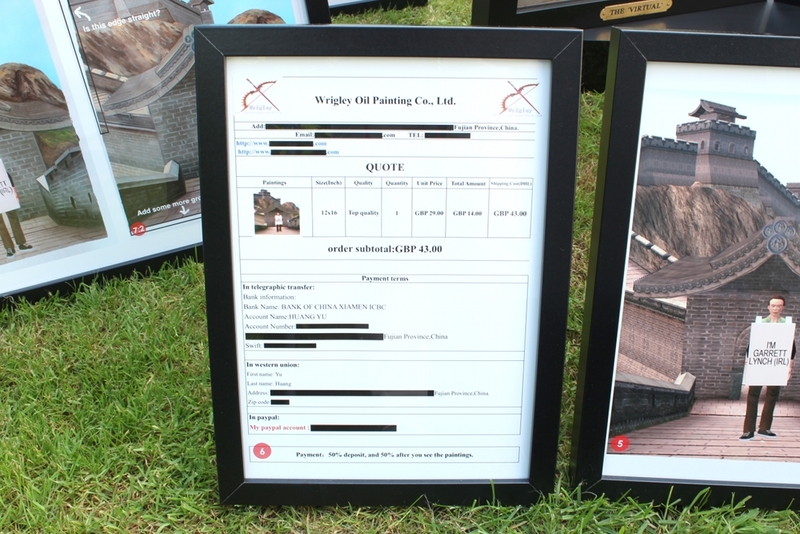 The backstory used in correspondence of performing on the Great Wall of China was a fabrication. 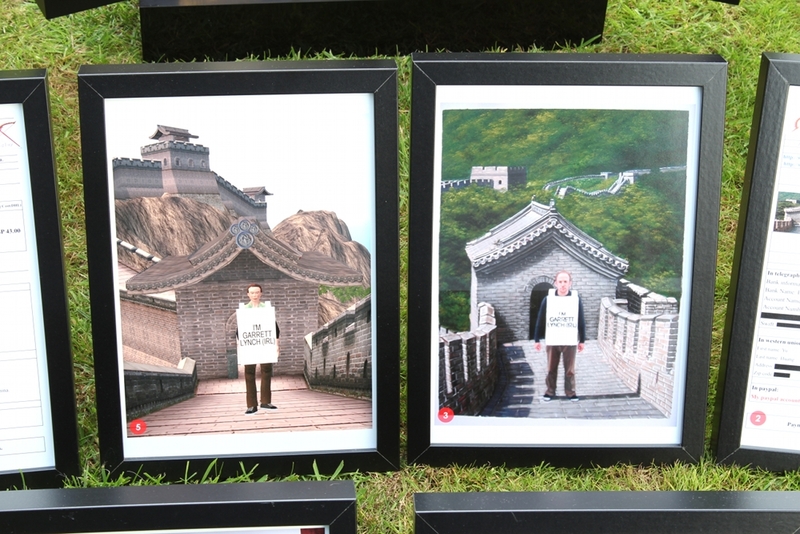 The artist had never visited the ‘real’ Great Wall of China and so no ‘real’ performance had ever occurred. The source photograph used was a combination of two separate digital images, one sourced from the web and one photographed by the artist. 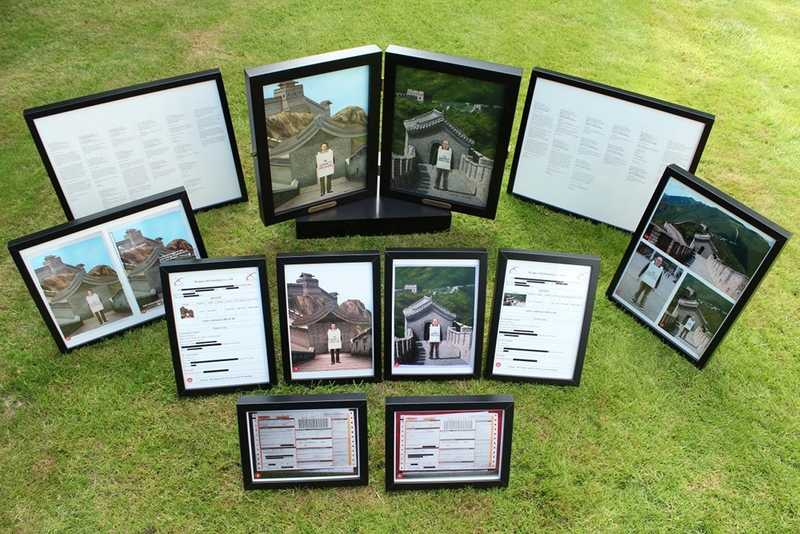 The outcome, the portrait and printed artefacts e.g. 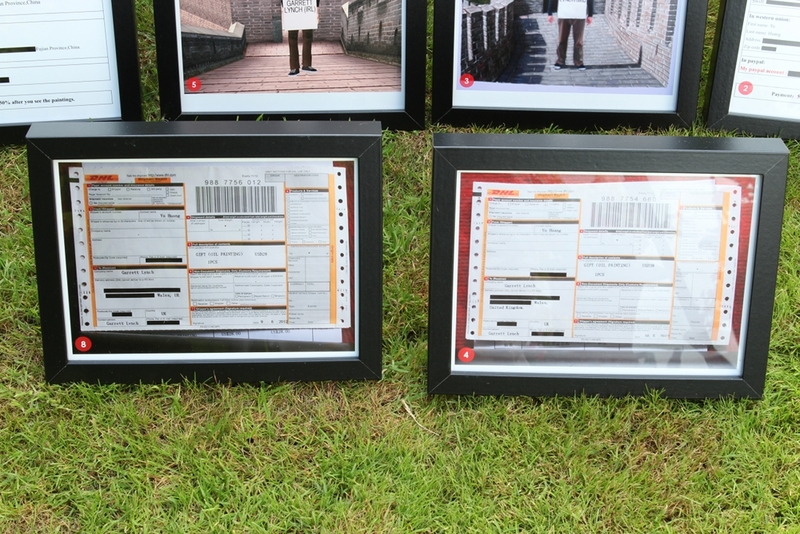 the fabricated source photograph, invoice, receipt, emails etc., are documentation of a fictitious performance. 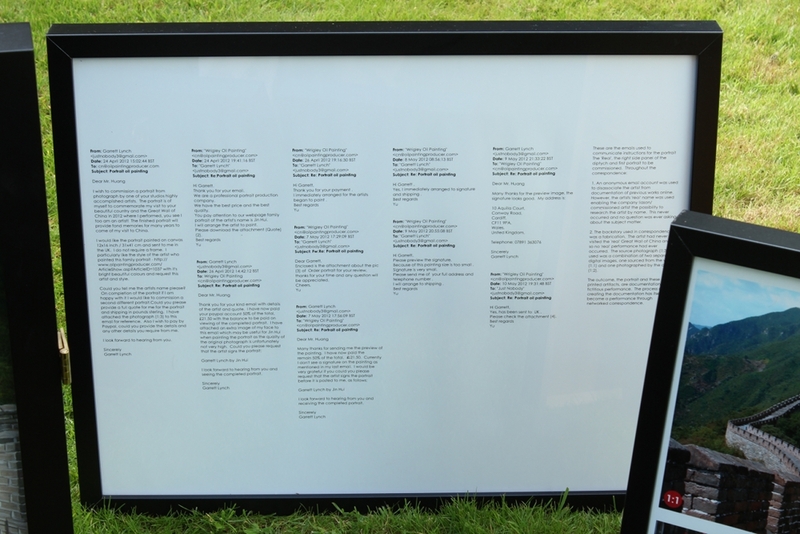 The process of creating the documentation has itself become a performance through networked correspondence. An anonymous email account was used to disassociate the artist from documentation of previous works online. However the artists ‘real’ name was used enabling the company liaison/commissioned artist the possibility to research the artist by name. This never occurred. 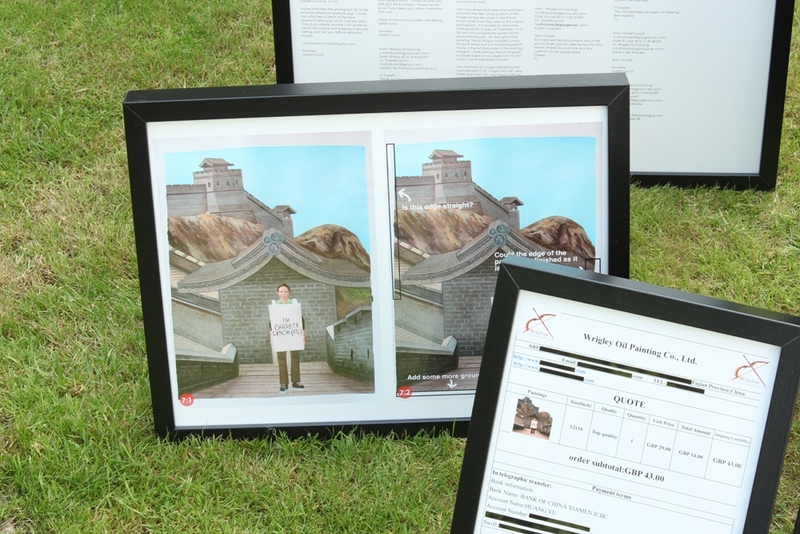 The backstory explained the source image as a screenshot from Second Life, suggesting a ‘virtual’ recreation of the visit/performance by the artist to the ‘real’ Great Wall of China (seen on the diptych’s right panel). The outcome is ‘real’ documentation of a ‘virtual’ performance. Its creation, through networked correspondence, transposes the ‘virtual’, digital and conceptual to the physical.